“Paris is the capital of the world today,” proclaimed French President François Hollande. “The whole country will rise up.” The occasion was that of a 1.5 million strong march in the French capital, noted by the presence of over 40 world leaders, with the conspicuous absence of the United States. The march was organised as a response to a series of attacks – the slaughter of 11 journalists at the offices of the satirical magazine, Charlie Hebdo, and a police officer on Wednesday, the shooting of a policewoman on Thursday with the wounding of a jogger, and the death of four hostages and the hostage taker Amedy Coulibaly at the Hyper Cacher supermarket on Friday. The march, and the grief, strike the necessary emotional register. The attendance list of the notables in attendance, however, was more problematic. The most striking difference was how lacking such a response was when the Danish flag lay burning in a range of countries after the publication of satirical cartoons on Mohammed in theJyllands-Posten in December 2005. Magazines and publishing outlets refused, in several instances, to republish the subject cartoons. Now, the commentator and offbeat philosopher Bernard-Henry Lévi assumes his mantle as spokesperson of this mood of enigmatic indignation and outrage. It is the voice of universal values articulated through that well worn effigy known as the French state and its civic duties. This is difficult on various levels, but BHL shows an even more tenuous grasp on the issue of what the enemy is. This is “jihadi fascism”, or so he claimed on CNN. “It is time for us to break, once and for all, with the Leninist reasoning that has been served up for so long by the useful idiots of radical Islam immersed in the sociology of poverty and frustration” (Wall Street Journal, Jan 8). The French Prime Minister, Manuel Valls, is certainly raising the dangerous stakes. On Saturday, he declared that France was at war with radical Islam. But what, exactly, is this war against? Such untidy reasoning has become the hallmark of responses of supposedly tolerant governments. This is why the list of political celebrities in attendance of the Paris march is troubling. Turkey’s Prime Minister, Ahmet Davutoğlu was present, representing state interests that are complicated in how they are intertwined with Islamic radicalism. The tip-toeing of Turkey with the Islamic State is well noted, as is the authoritarian move of the regime towards a more conservative brand of Islam. While Kurdish fighters have been shedding their blood in Kobane, Ankara continues to show ambivalence as to where it stands towards the ambitions of IS. The case becomes even murkier on the issue of free speech. If free speech is, in fact, the valiant creature that is meant to be the armed warrior against obscurantism, then some of the leaders in attendance seem like odd choices. For them, free speech is not something to treasure so much as dread and stifle. Turkey, to take one example, remains a star offender against the journalistic profession in the World Press Freedom Index. Questioning various dogmas of the government – that the Armenian genocide is not, for example, a genocide – will land you a prison sentence. Even more notable is the prospect that the same cartoons run by Charlie Hebdo in Turkey may well have seen its journalists targeted. The government can call upon various legal weapons to achieve its purpose of controlling freedom of expression, be it the penal code’s articles on defamation (Art 125), religious defamation (Art 216), obscenity (Art 226), to name but a few. Other countries also deserve mention. There is Egypt, Algeria and the United Arab Emirates. Then there is Russia. All place regime interests before free speech interests. All had representatives at the march. “I am Charlie,” may well a powerful statement of marketing value, but it is hardly universal. Reporters Without Borders was one of the first to note the contradictions. 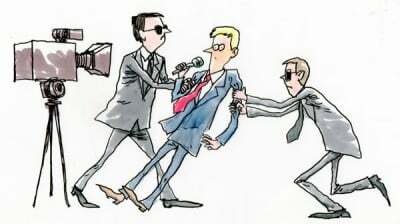 “Reporters Without Borders is appalled by the presence of leaders from countries where journalists and bloggers are systematically persecuted such as Egypt (which is ranked 159th out of 180 countries in RWB’s press freedom index), Russia (148th), Turkey (154th) and United Arab Emirates (118th)” (Reporters Without Borders, Jan 11). Then comes that rather troubling issue of terrorism – or at the very least what are perceived to be acts that fall within the dozens of definitions suggested in the social science canon. Israel’s Benjamin Netanyahu has made his position clear on the Palestinian state, on Palestinians in general and that old hoary chestnut of sovereignty. And the state he runs has not been remiss in its own periodic acts of military ruthlessness against those in Gaza, where Palestinian deaths assume statistical coldness before state brutality. They do not tend to merit a mention in BHL’s moral reflection on what terrorism is. The tragic tale of the recent killings in Paris, is that these were not acts lacking a compass. The direction was made even clearer once France joined the air campaign led by the United States in Iraq against the Islamic State. Bombs, at least the result of them, tend to be productive of only more bombs. Leninist sociological reasoning on poverty has nothing to do with it. A pretext for home generated brutality is minted with each intervention, with each impassioned appeal to storm distant foreign barricades. Jihadi fascism is the distorting less here, while free speech is ever the straw man cast in an argument that is actually Realpolitik. Regimes are capitalising on sprucing up their images, the police state has been given a shot in the arm, and even now, the significance of the Charlie Hebdo victims is being lost.